Thank you for branching out, Trees for Houston! Each project at TCWP develops an array of participants bringing unique knowledge and assistance. Sometimes a project gets an unexpected helping hand. As the year changes over, it’s a good time to show appreciation for Trees for Houston‘s contributions to the TCWP Stormwater Wetland Program in 2017. How does a tree organization help a wetland program? Let me show you in photos. 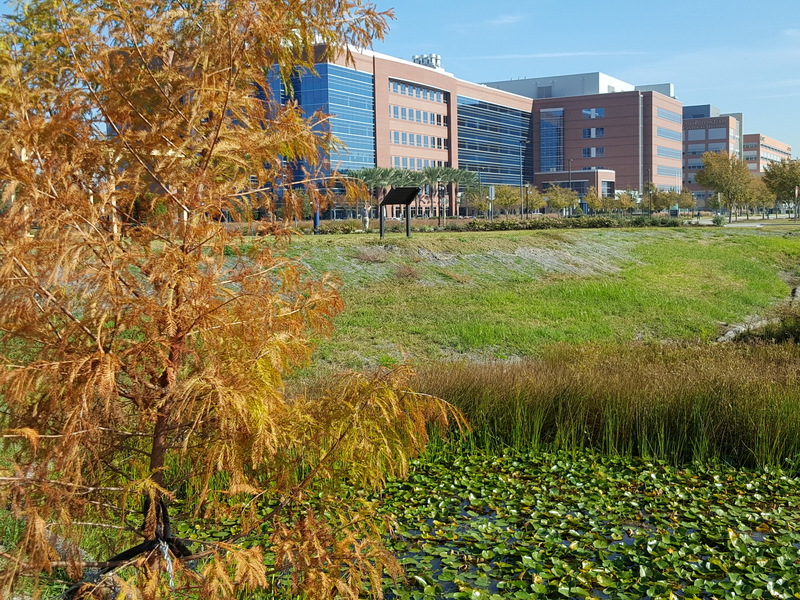 Trees for Houston donated four bald Bald cypress for the new stormwater wetland demonstration project at MD Anderson Cancer Center in Houston’s Texas Medical Center. The trees, showing this golden fall color in December, help draw the eye and will provide shade to this landscaped urban wetland. 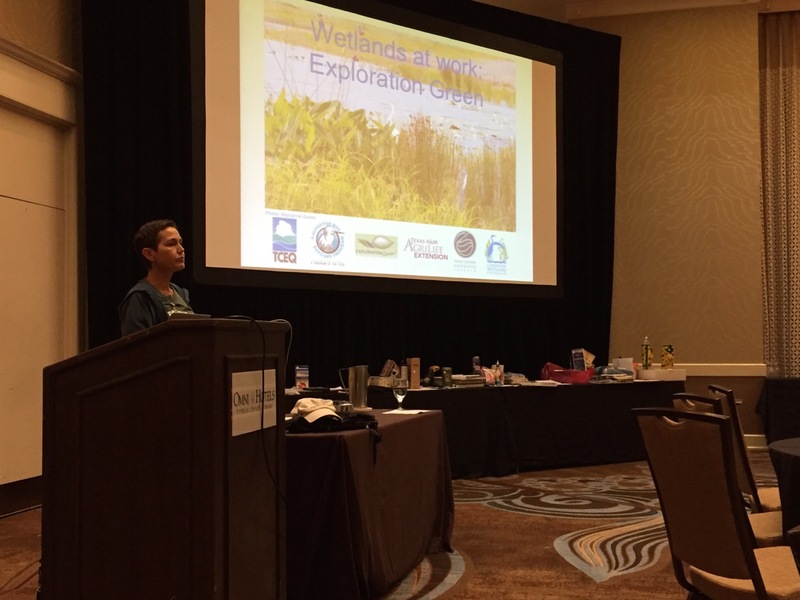 Trees for Houston made it possible for the TCWP Stormwater Wetland Program Specialist, Mary Carol Edwards, to attend the annual state conference of Texas Master Naturalists in Corpus Christi. She presented jointly with the with the Exploration Green tree nursery’s lead volunteer, Jerry Hamby. Photo: J. Hamby. 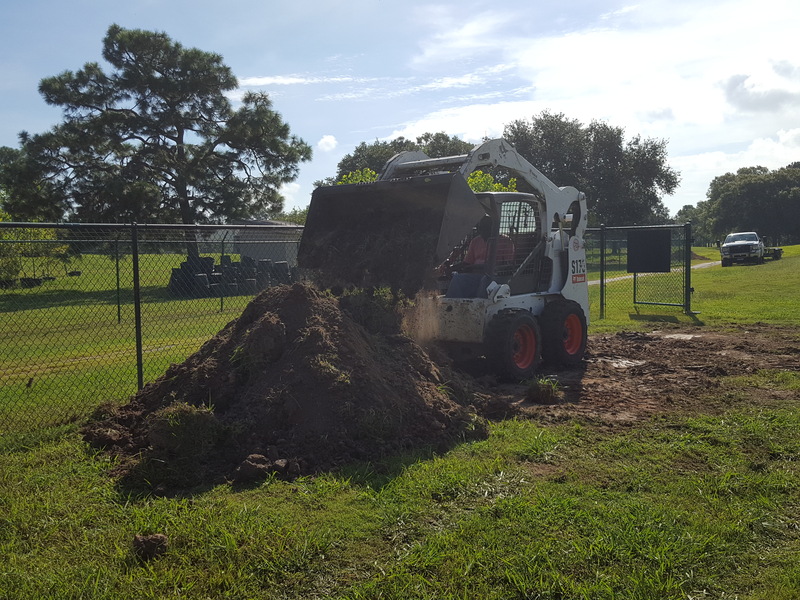 Trees for Houston sent a Bobcat and a staff member to scoop all our old craters of potting soil into one new pile at the Exploration Green wetland nursery. We recaptured about 6 cubic yards of soil, saving us a “ton” of money. And finally, we appreciate Trees for Houston’s pointing the way to planting on an island! 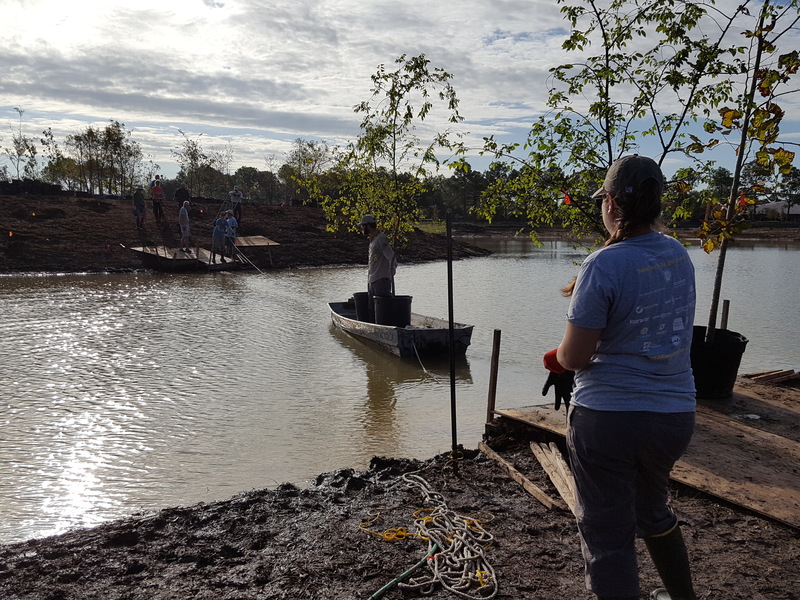 The Exploration Green habitat island’s wetland was planted shortly after the trees were planted, and we benefited from the TFH system of moving plants, equipment and volunteers. Here, trees are moved two by two using an improvised ferry. Thank you, Barry, Carolina, Carlton, and the other folks at Trees for Houston! Organizations like yours show what a benefit it is when the various fields of expertise branch out farther than expected to support each other on a project.